In Localism versus Globalism in Morphology and Phonology, David Embick offers the first detailed examination of morphology and phonology from a phase-cyclic point of view (that is, one that takes into account recent developments in Distributed Morphology and the Minimalist program) and the only recent detailed treatment of allomorphy, a phenomenon that is central to understanding how the grammar of human language works. In addition to making new theoretical proposals about morphology and phonology in terms of a cyclic theory, Embick addresses a schism in the field between phonological theories such as Optimality Theory and other (mostly syntactic) theories such as those associated with the Minimalist program. He presents sustained empirical arguments that the Localist view of grammar associated with the Minimalist program (and Distributed Morphology in particular) is correct, and that the Globalism espoused by many forms of Optimality Theory is incorrect. 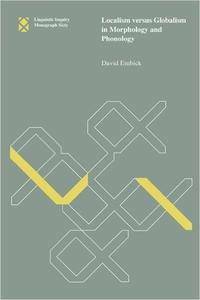 In the "derivational versus nonderivational" debate in linguistic theory, Embick's arguments come down squarely on the derivational side. Determining how to make empirical comparisons between such large positions, and the different frameworks that embody them, is at the heart of the book. Embick argues that patterns of allomorphy implicate general questions about locality and specific questions about the manner in which (morpho)syntax relates to (morpho)phonology. Allomorphy thus provides a crucial test case for comparing Localist and Globalist approaches to grammar.